Part of the beauty in doing what we do on a daily basis is that we get to offer up a lot of our own opinions on Android, tech, and world happenings. Droid Life is this great platform for expression and we take advantage of that more often than not. You may not always agree with what we say. In fact, we hope that you don’t, because that’s what makes our world great – people should have their own opinions on everything, especially when it comes to consumer tech. So with that in mind, we wanted to start up a new type of post for 2015 and see where it goes. Rather than a top 5 list from us (that you likely won’t agree with), we figured we would instead turn to you for expert analysis, opinion, and bold statements. This is your opportunity to tell the world which is the best, which isn’t, and why. The idea is pretty simple, really. We pick a category and a handful of products within it. We then ask you to decide which is the best of the group by voting in a poll. In other words, which would you choose from this group if you had to choose. From there, you can take to the comments and tell us what your choice is and why you came to that conclusion. Is it the specs? Is it the design? Is it battery life? Is it the camera? Is it the price? Is it the overall combination of elements? Why that product? Then, in a couple of days, we’ll share the results, some quotes from readers on why they chose what they chose, and maybe even stamp that product with a DL reader stamp of approval. Sound good? First up, we have three phones that are by all means flagship level phones. We are talking about the LG G3, OnePlus One, and Sony Xperia Z3. All three have high-end specs (or at least did when they were first introduced), yet each has its own special elements that helps it stand apart. Whether its the Laser Autofocus and rear placed buttons on the G3, or the insanely low price of the OnePlus One, or the premium build and outstanding battery life of the Xperia Z3, there are features from each that define them. 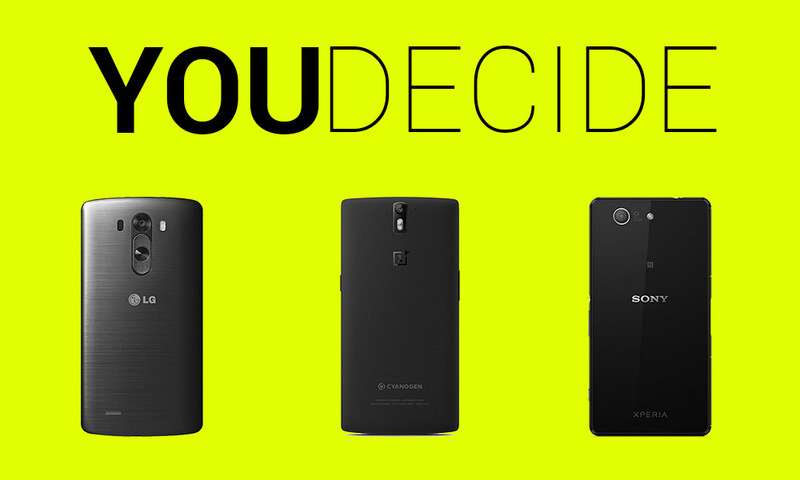 So if you had to make a choice for yourself or as a recommendation for someone else from these three phones, which would you go with? It’s your turn to decide.